One of Tasmania's most popular attractions is the Cradle Mountain-Lake St Clair National Park, placed on the UNESCO World Heritage list in 1982. Landscapes include ancient rainforest and alpine heath lands, interspersed with button grass and stands of deciduous beech trees. 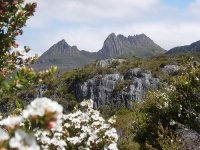 Trails winding through forests of King Billy pines around the mountain offer superb day treks, and the 50-mile (82km) trek from Cradle Mountain in the north to Lake St Clair in the south is Australia's most famous bushwalk. The Park is equipped with mountain huts that offer accommodation for long treks, and Cradle Mountain Lodge offers log cabins in a tranquil setting. Lake St Clair, a narrow 10-mile (15km) long waterway in the south of the park, is Australia's deepest natural freshwater lake.